With the mudslide that killed at least 41 people still fresh in residents' minds, Washington school officials warned Wednesday that thousands of children at 28 public schools across the state are at high risk of being swept away by landslides. The risk assessment comes near the end of a 276-page draft review of safety plans in the state's 295 public school districts. It concludes that 28 schools (PDF) — spanning the state, but concentrated in the more densely populated western half — are at "high" risk of significant landslide damage and that dozens more face a "moderate risk." "In many cases, there may be no practical landslide mitigation measure," according to the draft report, which advises that for schools at the highest risk, the only safe step forward may be "abandoning the facility and replacing it with a new facility." Landslides were known to be a significant geologic threat in Washington long before the March 22 mudslide that hit the area around Oso, about 50 miles northeast of Seattle. The state's active earthquake faults, abundant mountains and damp climate have caused numerous landslides. Research published in October in the Bulletin of the Seismological Society of America warned that a major earthquake could cause "devastating damage from landslides," especially in and around Seattle, the state's biggest city. Six of the high-risk schools are in that region. 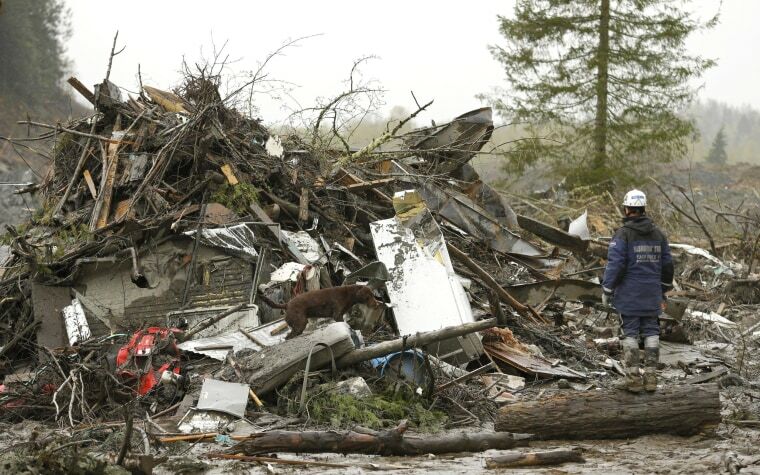 The assessment rattled parents and administrators for whom the Oso mudslide is still a daily news story. "As recent events in our state underscore, natural disasters can and do occur, and they can have terrible consequences," said Randy Dorn, the state superintendent of public instruction. At Queen Anne Elementary School in downtown Seattle, Jenny Brailey, the parent of a pupil at the school, said, "It just seems like it's flat up here, even though you are at the top of the hill. "You don't think of it sliding off the edge," she told NBC station KING of Seattle.